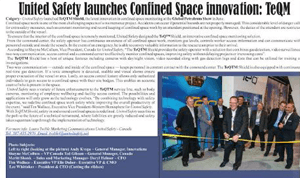 Worksite News, Canada’s Premier Occupational Health, Safety and Environment E-Magazine, has covered our launch of the TeQ™ Shield launch at the Global Petroleum Show 2015. The article mentions the considerable level of danger of confined space work, and the extra safety measures that must be in place to ensure risks are mitigated. It goes on to talk about the technology of the TeQ™ Shield, which combines video surveillance, two-way communication, continuous gas detection and access control to create an effective confined space monitoring solution. The article ends by discussing the roadmap of the product line. The possibilities and applications of the TeQ™ range will only grow as the technology evolves. United Safety foresees this is the stepping stone to a digital turnaround.